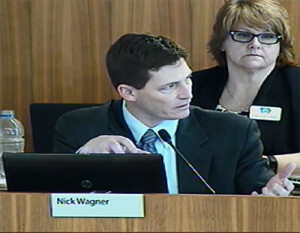 Board members Nick Wagner, Geri Huser and Libby Jacobs discuss the pipeline. The chair of the Iowa Utilities Board announced today that they have scheduled at least three more meeting to discuss the request for a construction permit for the Bakken oil pipeline. That announcement ended speculation the three-member board would make a decision on the issue following today’s meeting. Board members continued discussion on several issues that will help them determine if they will approved the permit. Board member Libby Jacobs of West Des Moines says the safety of the pipeline is one of the critical issues that has come up in the discussion. “There are several parties who indicated safety records were better for pipelines versus for rail and for truck lines. Others indicated just the opposite of that,” Jacobs says. 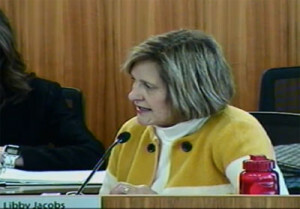 Jacobs says they need to look at the severity of the safety issues with each. “When you look at the records for the trucking and the railroads, there have been some fairly significant incidents that have occurred that have been presented in the evidence before us. And so one must weigh the significance of those versus the leakage of the pipeline,” according to Jacobs. Board member Nick Wagner of Marion says he agrees with Jacobs and talked about the rail accidents. “With the rail we’ve seen the incidents that have happened, have happened in populated areas — because that’s typically where railroads run because of the history of railroads linking cities and towns and populated areas,” Wagner says. He says the route of the pipeline may make it safer.”I think because the pipeline is not going through major populated areas and does avoid those, from that perspective, I think it is somewhat safer than by shipping by rail or truck,” Wagner says. Board Chair Geri Huser of Altoona, says the method of shipping is not her biggest issue. “I don’t see that whether it’s rail, pipeline or truck that there’s any inherent increases in safety,” Huser says. “I think they all have risks. And I think the real issue is whether there is any leakages or spill from any of those entities.” Huser says there’s evidence that pipeline accidents could have a bigger impact. She says some of the information she has read has shown there have been some larger accidents by pipeline than there are by rail or truck transportation. Huser says she is more concerned overall by how the spills are handled. 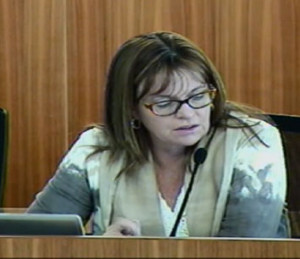 Huser says having looked at the information on the various types of accidents, the decision comes down to how the board views the safety factors that have been put in place to protect against an accident. The three discussed many other details during the meeting. The board will hold another meeting on February 19th and Huser says they have also reserved March 9th and 10th for additional days of deliberation. 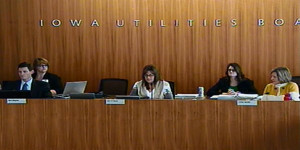 You can go to the Iowa Utilities Board website to find out more.